I kicked off writing for JuNoWriMo promptly at midnight, but I didn’t start on my novel. As a matter of fact, I still haven’t started the “main” project I’m tackling for June. I guess I should explain my plans. I’ve said June is for writing Flawed #4, and this is true, but first I have a few other projects to take care of. Protector (Flawed #3) is in revisions right now, and there were a few lingering scenes that needed to be created so I decided to use the June momentum to tackle those first. I completed both of those scenes last night during the kickoff party and wrote them probably a lot quicker than I would have if I’d done it on my own time (aka NOT for JuNoWriMo). The next thing I planned to tackle in June was a short story related to my Flawed series. In fact, this story is a prequel of sorts to Flawed #4. In Flawed #4 we meet Graham, a new [secondary protagonist] character, and this short story goes back five years earlier to give a little insight on an important event in his life. After writing a couple thousand words last night, I woke up and wrote more throughout the day. I ended up completing two scenes from Graham’s short story and hitting 5K overall. Hooray! 5,000 words is ALWAYS a successful day, and I have the badge to prove it! But something else off the wall happened today. I listen to the Author Strong Podcast, and on today’s episode Mat Morris issued a writing challenge—not just a challenge, a competition. With prizes, none the less! The competition: enter a short story (under 6,000 words) by June 25th. There are more specifics, but if you want the all details, listen to Episode 33a. So in addition to my other projects this month, I now have one more short story to not only plot, but write and edit as well. At least I can count all the words for JuNoWriMo. I’m writing all these different projects all in the same Scrivener file to make it easy to track. I’ve already started planning the one for the competition, and I can’t wait to dive in. Working on two different series at once may not be the best idea, but I don’t really want to let either go. So we’ll just call it an experiment. Really, everything I do is pretty much an experiment. So here’s to handfuls of WIPs and 5K days and brand new stories. I hope you had as fun of a June 1st as I did. Want to join in the fun? 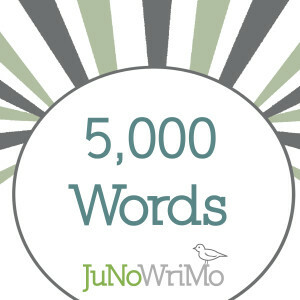 Sign up for JuNoWriMo 2015. This entry was posted in JuNoWriMo, Writing and tagged #amwriting, 5000 words, 5K, Author Strong Podcast, book, challenge, competition, flawed, June Novel Writing Month, JuNoWriMo, Mat Morris, NA, New Adult, paranormal, short story, suspense, thriller, urban fantasy, word count, write, writer. Bookmark the permalink.